As the world around us changes, the enduring principles of public relations continue to increase in importance. They consistently sculpt our decision making and counsel to peers and leaders of organizations. Accreditation sets standards of practice, legitimizes our profession and builds accountability by identifying those who have demonstrated broad business and communications knowledge, strategic perspective and sound professional judgment in the field. Accredited in Public Relations (APR) also demonstrates a commitment to lifelong learning and serves as a source of great personal pride for public relations practitioners, including those recently granted Accreditation. The PRSA Sunshine District held its first-ever APR Boot Camp in 2018 at Nova Southeastern University in Fort Lauderdale, Fla. More details will be released in early 2019 for our next APR Boot Camp. For more information, contact APR Boot Camp Chair Annabel Beyra, APR. 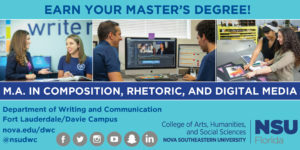 Special thanks to our 2018 Sunshine District APR Boot Camp Sponsor Nova Southeastern University’s Department of Writing and Communication. Did you know that PRSA Sunshine gives all members of its district a $100 reimbursement upon successful completion of the APR exam? All you need to do is pass the exam, then complete the Accreditation Scholarship Form. Once your member status and accreditation is verified, the check will be mailed out. It’s that easy!